We’d love your help. Let us know what’s wrong with this preview of What Am I Feeling? by Josh Straub. After several unchecked feelings threaten to ruin the big day, Sam and his friends start to learn how to give each emotion a name Can show-and-tell day be saved? To ask other readers questions about What Am I Feeling?, please sign up. Be the first to ask a question about What Am I Feeling? What Am I Feeling? held my children's attention as I read it and they liked the cute pictures. We talked a little about emotions and the book's message. It's not a book they want to read daily, but they pick it up sometimes. The concepts of (1) naming a feeling, (2) asking God for help with it, and (3) not letting the emotion control your actions are good lessons. Really good lessons, that both children and adults (myself included) need to remember. In the story, several children experience emoti What Am I Feeling? held my children's attention as I read it and they liked the cute pictures. We talked a little about emotions and the book's message. It's not a book they want to read daily, but they pick it up sometimes. In the story, several children experience emotions that are generally perceived as negative. One girl feels sadness, one girl feels jealousy, one boy feels afraid, and one boy feels angry. While the first three got reminded in various ways to acknowledge the feeling and not let it control his/her actions, the boy who got angry never got the same reminder or any consequence. He did apologize for his anger later in the story, but it stood out to me that he did not receive a reminder like the others did. Perhaps that bothers me more than it will others, but as the book is perpetuating self-awareness of emotions, I think that one should have been called out as well. In conclusion, my kids liked the story and illustrations in What Am I Feeling? by Dr. Josh and Christi Straub. I thought it missed the mark, but I still appreciate the premise of naming an emotion, praying for help, and not letting it dictate one's actions. Feelings are just that, feelings, they seem real to the person experiencing them, especially at the time, but they really have no control other than that which we give them. In What Am I Feeling? 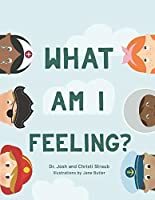 By Dr. Josh and Christi Straub, illustrated by Jane Butler (B&H Kids, 2019), Sam and his friends learn about feelings, what they are and how to handle them. Sam is afraid to share in front of the class, Hudson is happy, Alex gets angry, Sophie is sad and Jennie is jealous. Together the class learns Feelings are just that, feelings, they seem real to the person experiencing them, especially at the time, but they really have no control other than that which we give them. In What Am I Feeling? By Dr. Josh and Christi Straub, illustrated by Jane Butler (B&H Kids, 2019), Sam and his friends learn about feelings, what they are and how to handle them. By the end of the day, the group of friends are working together to identify their feelings, and they learn how their feelings can sometimes impact others. Sam starts out the day feeling afraid, but ends it feeling brave! This book has a pull out ‘feeling’s chart’ which can help children identify those feelings which leave them confused at times, and which will remind them that “a feeling is just a feeling. It’s not in charge of you.” And that they can turn to God for help in dealing with it. I received a copy of this book as a part of the publisher’s bloggers program. I was not required to write a positive review. At times, emotions can be hard to navigate as adults and harder still for children. As parents, it is important for us to help them to understand their wide range of emotions, what they mean, and how to handle them. What Am I Feeling? by Dr. Josh and Christi Straub is a wonderful book and resource to help children learn about their feelings. When it is show and tell day at school, Sam and each of his friends feel different emotions. Sam feels afraid, Alex experiences anger, Sophie gets sad, and Je At times, emotions can be hard to navigate as adults and harder still for children. As parents, it is important for us to help them to understand their wide range of emotions, what they mean, and how to handle them. When it is show and tell day at school, Sam and each of his friends feel different emotions. Sam feels afraid, Alex experiences anger, Sophie gets sad, and Jennie feels jealous. The book is a delightful read with colorful pictures every child will be able to relate. Children will be able to identify with the characters and the emotions illustrated. The story becomes an example of how to best handle their emotions when their day does not go as hoped. There is also a pull-out chart of emotions which parents, and teachers, can use for discussion. This is a great book to help children to reflect on their emotions and how best to handle them. This is a great book for kids on identifying their feelings and realizing that their feelings don't need to control them. It includes a pull-out feelings chart. Sam has butterflies in his stomach and is afraid to go to school. His dad helps him by saying, “Sam, what you feel matters, but it doesn't have to control you. Giving each feeling a name helps you know what to do with it.” He then tells him “a feeling is just a feeling. It's not in charge of you. If you feel afraid, take a deep breath, n This is a great book for kids on identifying their feelings and realizing that their feelings don't need to control them. It includes a pull-out feelings chart. Sam has butterflies in his stomach and is afraid to go to school. His dad helps him by saying, “Sam, what you feel matters, but it doesn't have to control you. Giving each feeling a name helps you know what to do with it.” He then tells him “a feeling is just a feeling. It's not in charge of you. If you feel afraid, take a deep breath, name your feeling, and ask God to help you with it.” Sam then goes to school where he sees other kids dealing with feelings. He helps them and they all end up working on their feelings and not letting them control them. In the end, Sam tells his parents about his day and how he asked God to help him. It is recommended for ages four through eight, but it has a message older children and even adults could learn from too. It is a scientifically and biblically based message. I highly recommend this book. Emotions can be uncharted territory for children, but it's of utmost importance for parents and other adults in a child's life to teach them how to handle emotions appropriately. By creating a safe environment, we can set our kids up for future success in this area. I tend to struggle with the balance between empathy and toughness with my children's emotions. This book provided both me and my kids with a script for how to deal with big feelings. Now, when situations arise, we work through the sc Emotions can be uncharted territory for children, but it's of utmost importance for parents and other adults in a child's life to teach them how to handle emotions appropriately. By creating a safe environment, we can set our kids up for future success in this area. I tend to struggle with the balance between empathy and toughness with my children's emotions. This book provided both me and my kids with a script for how to deal with big feelings. Now, when situations arise, we work through the script and I have seen firsthand how empowered my kids feel as a result. What Am I Feeling? by Dr. Josh and Christi Straub is such a wonderful resource for kids of all ages! My 6 and 2 year old boys both enjoyed listening to this book and were so excited to see the pull-out chart at the end of the book! I love the simplicity of the illustrations and the bright and cohesive color scheme of the book! I appreciate the range of emotions discussed in the book, and that there are extras we can discuss as a family in the included chart. The repeated lines, “a feeling is jus What Am I Feeling? by Dr. Josh and Christi Straub is such a wonderful resource for kids of all ages! My 6 and 2 year old boys both enjoyed listening to this book and were so excited to see the pull-out chart at the end of the book! I love the simplicity of the illustrations and the bright and cohesive color scheme of the book! I appreciate the range of emotions discussed in the book, and that there are extras we can discuss as a family in the included chart. The repeated lines, “a feeling is just a feeling. It’s not in charge of you. If you feel afraid, take a deep breath, name your feeling, and ask God to help you with it,” will be some I hope to use with my boys to remind them that they don’t need to feel controlled by their emotions - that’s helpful to remember even as an adult! I’m sure this is a book we will keep reading for years to come! My 6 year old stated, “I think this is going to be my new favorite book,” after we’d read it a few times! The costumes that the characters are wearing and the familiar classroom setting both contributed to him enjoying this book. Trivia About What Am I Feeling?